The disaster of October's wildfires didn't stop once the flames were finally extinguished. The toxic ash left by the firestorms—incinerated plastics, hydrocarbons, solvents, pesticides, heavy metals—lay like a ticking bomb on home sites, awaiting a rain storm to wash the deadly debris into drains and creeks. Once in waterways, the lethal plume could infiltrate watersheds and imperil drinking water and aquatic life. 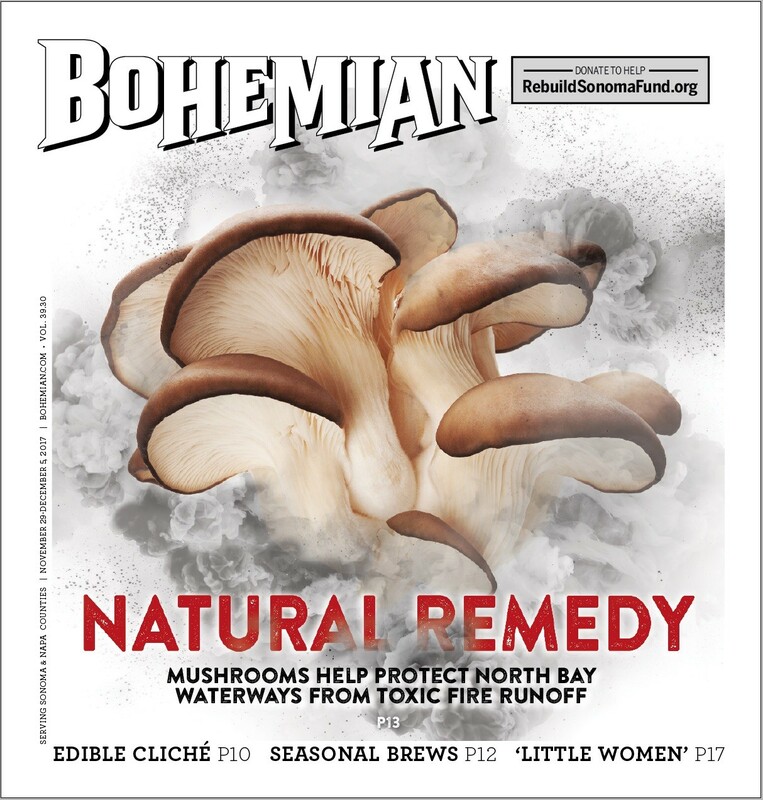 But thanks to an unprecedented public-private partnership, protection from that environmental hazard in hard-hit areas like Coffey Park, Larkfield-Wikiup and Fountain Grove has come from an unlikely source: mushrooms. And word spread quickly. The project took off as another example of the volunteerism and generosity that have characterized local efforts after the fire. Sebastopol's Gourmet Mushrooms donated thousands of pounds of substrate used to grow mushrooms. Sonoma Compost and West Marin Compost donated compost. Petaluma's Wattle Guy provided, you guessed it, wattles—barriers and fences made from natural materials like rice straw and sticks. And groups like Russian Riverkeepers and the Clean River Alliance marshaled volunteers to make, fill and install the wattles and monitor water flow during and after the recent rains. It's too early to know what impact the group has had in staving off another catastrophe. Data is still being collected and winter hasn't even begun yet. But if the techniques prove effective, their efforts could be used as a case study for use elsewhere when urban firestorms occur—which fire experts say is a question of when, not if. Ohlsen says the undertaking offers a "tragic opportunity" to divert and neutralize the toxics from this disaster and to prepare for future wildfires. "These wildfires aren't going anywhere," he says. "They are ramping up in severity." TOXIC TIDE The green wattle atop this water barrier has been inoculated with mycelium, the weblike network of fungus that sprouts mushrooms. In the days after the fires, Ohlsen, who owns Permaculture Artisans in Sebastopol, had been meeting with Daily Acts' Trathen Heckman to brainstorm how to mitigate the effects of erosion and runoff from burn sites. Daily Acts is a Petaluma-based nonprofit volunteer organization that has served as a nexus for recovery efforts around the fire. "The rain is coming," Ohlsen said. "What do we do?" 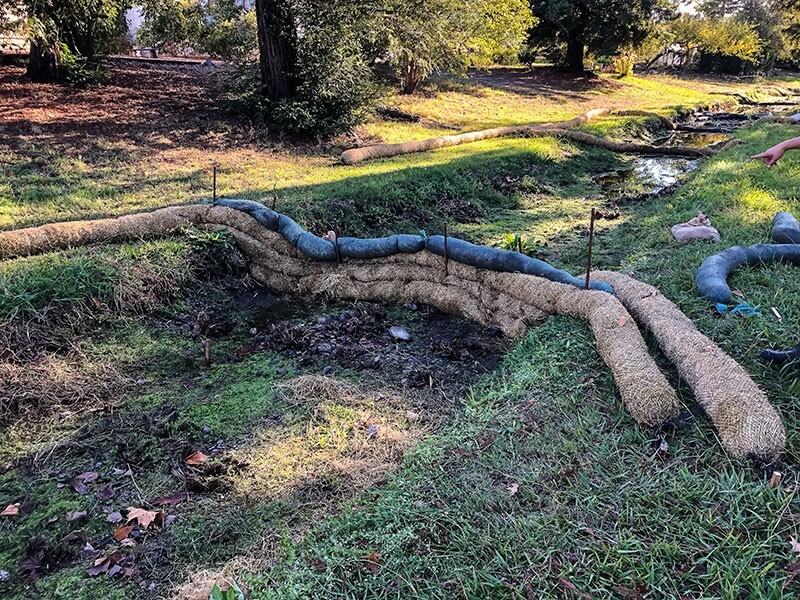 Ohlsen and Heckman settled on rice-straw wattles as the quickest, easiest technique for absorbing and diverting hazardous runoff. Ohlsen took the idea one step further: Why not inoculate the wattles with mycelium, in the hope that mushrooms that grew could absorb and in some cases transform the toxins through a process called chelation? The toxin-laden mushrooms would then be harvested and disposed of offsite. Mycelium is the weblike network of fungus that grows underground. The use of mushrooms to clean up landscapes is called mycoremediation, a technique that's gaining acceptance in cleaning up oil fields and toxic waste sites. Permaculture is a method of design based on the principles and systems of nature, and mycoremediation exemplifies the practice. "It's the perfect answer for this moment," says Ohlsen.